Studies of retroplasmid replication rely on analyzing polymerase activity in plasmid-containing ribonucleoprotein (RNP) particles isolated from mitochondria (Kuiper and Lambowitz 1988; Wang et al. 1992; Kennell et al. 1995; Walther and Kennell 1999) and characterization of in vivo replication intermediates (Stohl et al. 1982; Akins et al. 1986, 1989; Kennell et al. 1994; Nagasaka et al. 2003; Simpson et al. 2004). The limitations of efficiently transforming mitochondria outside of S. cerevisiae (Johnston et al. 1988) and C. reinhardii (Boynton and Gillham 1996) have been a major constraint in fully elucidating the mechanism of replication of mitochondrial plasmids. However, despite this limitation, studies of retroplasmid replication have revealed several surprising results, some of which have significant evolutionary implications. The 3.6 kb Mauriceville plasmid is transcribed by the host mitochondrial RNA polymerase, and transcription initiation occurs approximately 260 nt upstream of the site at which cDNA synthesis begins (Kennell et al. 1994; Fig. 3). Transcription is thought to proceed by a rolling-circle mechanism. The resulting RNAs are cleaved at a specific site which generates unit-length transcripts (Akins et al. 1986; Kennell et al. 1994). 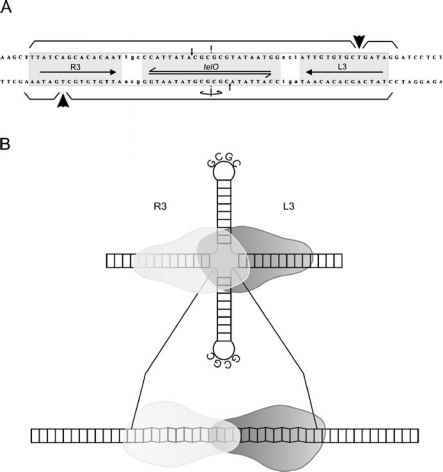 The 3' end of the plasmid transcript contains sequences that can potentially fold into a tRNA-like structure and terminate in tandem CCA sequences (Kuiper and Lambowitz 1988). These RNAs appear to function both as mRNAs for the synthesis of the pMaur-RT and as templates for (-) strand cDNA synthesis. Translation produces an 81 kDa polypeptide that has reverse transcriptase activity (Kuiper and Lambowitz 1988; Kuiper et al. 1990). In mitochondria, the pMaur-RT is tightly associated with the plasmid transcript in a ribonucleoprotein complex and in reactions having partially purified mt RNPs and labeled deoxynu-cleotides, pMaur-RT produces full-length (-) strand cDNA products (Kuiper and Lambowitz 1988; Wang et al. 1992; Kennell et al. 1994). Posttreatment of reaction products with RNase, protease, or alkali has no effect on the cDNA products, indicating they do not have large attached RNAs or proteins that could function as primers. Fig. 3 Hypothetical replication cycle of circular retroplasmids. The double-stranded DNA plasmid is transcribed by the mt RNA polymerase and the transcript (dotted line) is cleaved at a site ~ 260 bp downstream from the promoter (arrowhead), yielding a monomer-length RNA having a tRNA-like structure and 3' CCA. 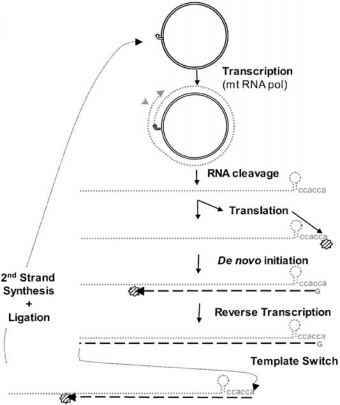 The transcript serves as both the mRNA for translation of the reverse transcriptase and as template for cDNA synthesis. The plasmid-encoded RT (diagonally-striped star) initiates (-) strand cDNA synthesis de novo, opposite the penultimate nucleotide of the transcript. Once the RT has reached the end of the RNA template, it can template switch to a second transcript, forming linear, concatenated cDNAs. Following (-) strand synthesis the RNA template is either degraded by the mt RNase H or displaced during (+) strand synthesis. Following the formation of the second strand, the ends of the plasmid DNAs may ligate to form the double-stranded circular DNA or homologous regions of concatenated dsDNAs may recombine to generate circular forms micrococcal nuclease to degrade endogenous RNAs, the resulting RT preparations initiate cDNA synthesis using the 3' hydroxyl of previously synthesized cDNAs that remain associated with the enzyme (Wang et al. 1992). This so-called "primer-dependent" initiation occurs at the extreme 3' end of the RNA transcript. Subsequent studies showed that the pMaur-RT can also utilize synthetic DNA oligonucleotides, and shows little preference for specific se quences (Wang and Lambowitz 1993a; Chen and Lambowitz 1997). The ability to use DNAs (or cDNAs) to initiate new synthesis is reminiscent of template switching mechanisms associated with retroviral RTs; however, in the case of the pMaur-RT, DNA primers do not need to base pair with RNA templates, thus priming operates in a homology-independent manner (Kennell et al. 1994; Chiang and Lambowitz 1997; Chen and Lambowitz 1997). A similar mechanism appears to be used by non-LTR retrotransposons (Bibillo and Eickbush 2002). When the pMaur-RT is isolated from mt RNP particles using PEI, it is free of associated nucleic acids and can initiate cDNA synthesis without a primer (de novo). Rather than starting at the extreme 3' end of the plasmid transcript, primer-independent initiation occurs opposite the penultimate nucleotide of the RNA templates (CCA-3'), using guanine as the initiating nucleotide (Wang and Lambowitz 1993a). Initiation of DNA synthesis without the use of a primer is unprecedented and suggests that circular retro-plasmid RTs have an evolutionary relationship with RNA-dependent RNA polymerases that initiate without the use of a primer at the 3' end of RNA templates (RdRps; Wang and Lambowitz 1993a). Coupled with the basal position that retroplasmid RTs occupy in reverse transcriptase phylogenies, this finding supports the hypothesis that the Neurospora retroplasmids represent a contemporary example of a primitive genetic element, and suggests that they are related to early DNA-based life forms (Maizels and Weiner 1993). Primer-independent initiation would result in the synthesis of (-) stand cDNA products that lack a terminal nucleotide. It is possible that a terminal T residue is added following synthesis or during second strand synthesis; however, this may not be necessary. Upon reaching the 5' end of the RNA template, the pMaur-RT appears to template switch to the 3' end of a second transcript, creating dimeric and multimeric cDNAs (Kennell et al. 1994). These concatenated molecules presumably serve as templates for second strand synthesis, and may obviate the need for a terminal nucleotide addition activity. At present, steps following (-) strand cDNA synthesis are poorly understood, and it is unclear whether the plasmid RT or another polymerase catalyzes the synthesis of the (+) strand. The RNA template may be displaced during second strand synthesis, or it could be degraded by a mitochondrial RNase H (Wang and Lambowitz 1993b). Following the formation of the second strand, the ends of the plasmid DNAs may ligate to create the double-stranded circular DNA form that, in turn, can recombine to generate the concatenated forms that predominate in mitochondria. Alternatively, homologous regions of concatenated dsDNAs could recombine to generate circular forms. The finding that the Mauriceville plasmid transcript has a 3' tRNA-like structure that ends in CCA suggests that the retroplasmids are related to certain plant RNA viruses (such as brome mosaic or turnip yellow mosaic virus; Miller et al. 1986; Kuiper and Lambowitz 1988). However, in vitro studies with the pMaur-RT show that the 3' structure is less important than the ter minal CCA sequence (Chen and Lambowitz 1997). The pMaur-RT can also readily copy mitochondrial tRNAs and its promiscuous nature can lead to the formation of variant forms of dsDNA plasmids that contain cDNA copies of mitochondrial tRNAs (Akins et al. 1986,1989; Kennell et al. 1994; Chiang et al. 1995; Chiang and Lambowitz 1997; Fox and Kennell 2001). The tRNA copies are inserted precisely downstream of the plasmid tRNA-like sequence and retain the posttranscriptionally added CC sequence, which indicates that they were copied via reverse transcription. Interestingly, the inserted sequences often include GC-rich sequences that derive from regions of the mt genome. Variant plasmids that contain cDNA copies of mt tRNAs can integrate into the mtDNA via homologous recombination or non-homologous mechanisms, and result in senescence of the host (Chiang et al. 1995; reviewed in Lambowitz and Chiang 1995). There is also a report of a variant plasmid that causes senescence without integrating into mtDNA (Stevenson et al. 2001). In this case, the variant plasmid replicates to a high copy number and interferes with the translation of mitochondrial genes. The ability to copy non-plasmid-derived RNAs indicates that the RT can function in trans, a feature that is likely to have played an important role in maintenance of the VS satellite plasmid. The 881 bp circular VS plasmid is transcribed by the host mt RNA polymerase, and the VS RNA undergoes a self-catalyzed cleavage/ligation reaction to form a circular RNA that appears to function as a template for the Varkud RT. Steps following the synthesis of (-) strand cDNAs are presumably similar to those associated with the helper plasmid (Kennell et al. 1995).